Q. 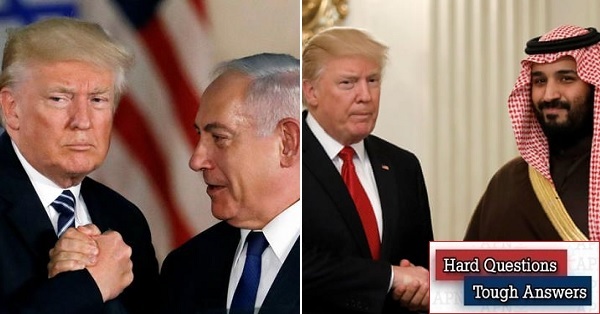 In last week’s State of the Union address, what did President Trump say about his “ultimate deal” for peace between Israel and the Palestinians and about the Iranian threat to Israel from Syrian bases? A. Absolutely nothing. He took credit for moving the US embassy to Jerusalem and he accused Iran of threatening “genocide against the Jewish people”. But the signature element of his election campaign and the early months of his presidency, that ultimate peace deal, was missing. Further, while attacking Iran, taking credit for withdrawing from the JCPOA and bragging about defeating ISIS and withdrawing from Afghanistan, the president never mentioned Israel’s major security concerns: Iran’s presence in Syria, or for that matter Russia’s presence in Syria. There appear to be several possible explanations for the omission regarding a peace process. One is that talk about a peace deal is bad for Trump’s “base” because it hints at possible concessions being imposed by the administration upon Israel. Another, related explanation is that the administration appears to have sobered up about the non-existent prospects of sponsoring a real Israeli-Palestinian peace and now prefers that the world forget about its initiative. Certainly Prime Minister Netanyahu would prefer it that way, so that (assuming he is reelected and beats impending corruption indictments) he can proceed with his agenda of gradually swallowing up the West Bank. True, presidential peace emissaries Kushner and Greenblatt are coming to the region in late February to talk about their peace plan, but only with the wealthy Gulf states that are expected to provide a financial “peace dividend”. No one, including Netanyahu, can object to the administration’s effort to recruit Arab money, particularly as long as Palestinian leader Mahmoud Abbas conveniently boycotts the entire still-born process. Q. And regarding the threat from Iran in Syria? A. Here Trump seems as usual to have his own bizarre plans and concepts. Not only has he publicly belittled his intelligence establishment’s assessment that Iran “is not currently undertaking . . . key nuclear weapons-development activity”. Not only has he publicly proposed, to the astonishment and objections of both the Pentagon and the Iraqi leadership, that US bases in Iraq somehow be used to monitor or “watch” Iranian forces. On February 3 he went on to state on “Face the Nation” that a few of those US troops that may or may not be staying for a while yet in Iraq and possibly Syria are there because “we have to protect Israel”. Note that Israel has never asked to be “protected” by US troops in the Arab world. Some Israelis found Trump’s statement embarrassing. In this context the president was presumably referring to several hundred US troops at Tanf, on Syria’s side of its borders with Jordan and Iraq. Their strategic deployment hundreds of kilometers from Israel is thought to be helpful in interdicting Iran’s drive to link up by land, via Iraq and southern Syria, with “useful” or western Syria where Tehran now has logistics bases that facilitate its designs on the region and specifically against Israel. Nowhere in any of these recent speeches or interviews has Trump referred to the US quandary in northern Syria, where in withdrawing its small troop contingent it is abandoning Syrian Kurds (who did specifically request US protection) to the vagaries of Turkish, Russian, Syrian and Iranian policies. That imbroglio, incidentally, is a far more serious challenge to US (and Israeli) strategic interests than abandoning or not abandoning Tanf. Ultimately, Israel will have to look after its strategic interests in Syria without much US help. To get Iran out of Syria it will have to talk to Moscow (Netanyahu is scheduled to meet with Putin there on February 21), not Washington. That is where Trump’s lack of strategic thinking for the Middle East leaves us. Q. Indeed, is there a bottom line here regarding President Trump’s understanding of Middle East strategic issues? A. 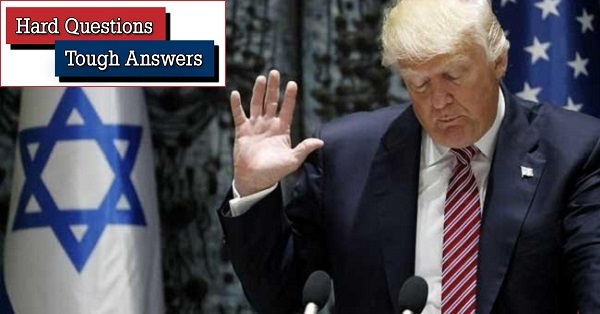 One can only conclude from what Trump has said and not said publicly in recent days that he understands nothing about the Israeli-Palestinian conflict, absorbs nothing when being briefed by Intelligence aides, cannot read a map, and doesn’t even really appreciate the import of requests by Israel and relevant Arab countries that the US remain in Syria as a trip-wire deterrent and to balance the Russian presence, rather than “protecting” anybody or anything. Q. Is Israel Resilience party leader Benny Gantz beginning to resolve the apparent contradictions between the liberal views he expressed in his opening (and thus far only) speech and the right-wingers on his Knesset list? These statements appear to contrast sharply with Gantz’s initial commitment to limit construction to the West Bank settlement blocs and to withdraw unilaterally from the West Bank if a negotiated peace deal fails. Indeed, Gantz now appears to be committing to negotiate with Israel’s Arab state neighbors, not with the Palestinians. If all this sounds suspiciously rightist rather than centrist, it is. No prominent left-wingers or centrists have joined Gantz’s party. Social and economic-rights campaigner Orly Levy-Abakasis has walked away. The party has made no new gains against the Likud in the polls. And the right-religious bloc is holding its own in the polls against the centrist bloc Gantz aspires to lead. All this explains why Israel Resilience appears increasingly to be leaning to the right. A single interview Gantz gave Yedioth Aharonot last weekend in which he fielded softball “atmospherics” questions from a popular entertainer did nothing to dispel the fog concerning what his party really stands for. The only strategic election issue related to Israel Resilience that is currently undecided concerns whether Labor and Meretz voters who initially bolted to Gantz will now begin to return home in sufficient numbers to give those two parties a respectable turnout in April’s elections. They have their own democratic primaries this week. They still won’t discuss uniting for the elections. But regardless of whom they nominate in their primaries, opinion polls could soon force them to merge. Q. Apropos, the Likud held its primaries last week. Democracy at work? Corruption at work? A slap in the face to Netanyahu? A. Surprisingly, all of the above. First, tens of thousands of Likud party members turned out to vote for and rank the first 40 or so candidates for the Likud Knesset list. In contrast with previous elections, the primaries this time appeared to run smoothly and without disruption. The outcome was surprising, too. Gideon Saar, former “star” Likud minister and a Netanyahu opponent and nemesis who seeks to replace the prime minister and who, accordingly, was blacklisted by the Likud leader in his recommendations to the party faithful, polled fourth on the Knesset list (meaning fifth after Netanyahu, whose status at the top was guaranteed in advance). In first place was Knesset Speaker Yuli Edelstein, whom Netanyahu also refused to endorse. Oren Hazan, whose persistent misbehavior in the outgoing Knesset was an embarrassment to the party, was dropped, as was David Sharan, a former Netanyahu aide who has already been indicted in one of the PM’s corruption scandals. The Likud public appeared to be voting responsibly and maturely in its primaries. True, two of Saar’s partners in the opening quintet, Transportation Minister Yisrael Katz and Culture/Sports Minister Miri Regev, failed miserably at their jobs but were nevertheless rewarded by Likud voters for their crass populist gestures. But that’s the Likud--or should I say, that’s Israeli politics. But wait, it gets worse. A few days went by and--surprise, surprise--incredible irregularities began to be reported at more and more of the Likud’s 113 nationwide polling stations. At the Mitzpe Jericho settlement, for example, out of 153 registered Likud voters Science and Technology Minister Ofir Akunis received 229 votes (he ended up in 14th place overall). In ultra-Orthodox Bnei Brak, Miri Regev received 436 votes from only 334 registered voters. Immigration Minister Yoav Gallant received 780 votes in Kiryat Malachi from only 516 registered voters (he ended up in seventh place), while Yisrael Katz got 1,061 votes in Netivot from a mere 1,047 registered voters. By Sunday evening, Likud Comptroller Shai Galili was calling for a recount, citing "a complete contradiction between the results of the elections and the documentation done by the observers at the different polling stations." All of a sudden, the Likud seemed as corrupt as the prime minister. Netanyahu, for his part, was busy calling on the smaller right-wing parties, one or two of them openly racist and none even aspiring to be democratic in terms of the process of putting together their Knesset lists, to unite for elections. The supreme goal is to beat the four-mandate election threshold. Every right and religious party, however exotically extreme, must score well enough to guarantee at least four mandates; anything less and their votes are wasted. Netanyahu apparently calculates that only in this way will the right-religious bloc retain its Knesset majority and name the next prime minister.